Find talent for short-term needs or permanent roles – even for hard-to-fill positions. Contact Resolve Recruit, one of the premier recruitment agencies in Mississauga. We deliver candidates who fit your culture, have the right skills and language fluency. Resolve Recruit services Canada and the Greater Toronto Area: Toronto, Mississauga, Brampton, Milton, Oakville, Burlington, Vaughan, Markham, Richmond Hill, Barrie, Pickering, Ajax, Whitby & Oshawa. Choose Resolve Recruit, Inc for all your short-term, seasonal or project-based staffing needs. Get skilled help when you need it, from a single day absence to a long-term project. Balance staff to business demands without adding to your permanent team. We’re a leading supplier of temporary staff in Mississauga and the Greater Toronto Area. Try a candidate on the job before extending an offer. Lower your hiring risks and ensure a better match by using our Mississauga recruitment agency. Growing your full-time team doesn’t have to be a full-time job. Let Resolve Recruit manage your hiring process – see better quality candidates and hire more effectively. We search, prescreen, present, arrange interviews and provide reference checks for all qualified candidates according to your criteria. Our goal ratio is 3:1 – of every three candidates from Resolve Recruit, one should be the perfect fit. This saves you time, training expenses – and reduces turnover. We offer over one thousand assessments in a variety of different fields and skill sets. Assessments can range from basic to advanced levels and include accounting, behavioural, call centre, financial, healthcare, industrial, languages, software, technical environments — and more. Need executive talent? We recruit from our professional network – including passive candidates not currently looking for a job. You’ll see only the best prospects, so you spend less time away from your core business. Looking for bilingual staff? Resolve Recruit connects you with skilled French, Spanish and Mandarin speakers. Our multilingual and bilingual recruitment consultants assess all bilingual candidates thoroughly and effectively for job and language skills. If you are looking for expert bilingual professionals for any position, in any industry, Resolve Recruit can provide the right person, every time. We have professionals available who are fluent in English, French, Spanish and Mandarin. Finding the right candidate isn’t always easy. Whether you’re trying to fill temporary jobs, or looking for a permanent placement, let us help. As one of the leading recruiters in Mississauga, we know what it takes to find the skills and personality your company needs. 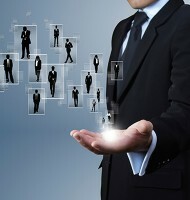 Remove the burden of hiring and leave it to our recruitment experts to get the job done right. Our recruitment agency serves clients in Brampton, Vaughan, North York, Oakville, Etobicoke, Mississauga, Burlington, and throughout the Greater Toronto Area. Resolve Recruit will Search. Find. Connect!